"The average camping tourist leaves behind twice as much as the average cruise ship tourist." In a comprehensive study by a Norwegian professor specialising in the psychology of tourist experiences Svein Larsen cruise passengers are found to be low spenders compared to other tourists. "Few studies have compared cruise passengers to other tourists in terms of various behavioral variables. The present study focuses on cruise passengers' expenditures while visiting a harbour. As part of three larger studies, cruise passengers and other tourists were interviewed about their expenditures while visiting western Norway. "Study 1 was performed during the summer of 2010 (N = 1891 tourists of whom 9% (165) were cruise passengers). Respondents were asked about their estimated total expenditures on the day they were interviewed. Study 2 was performed during the summer season of 2011 (N = 2478, of whom 388 (15.8%) were cruise passengers). Respondents were interviewed about their expenditures (total amount today), and about how they spend their money while visiting the current destination "today". The data for Study 3 were collected during the summer of 2012 in a study of 4002 respondents of whom 18.9% (756) were cruise tourists, basically addressing the same issues. Results indicate that cruise passengers spend significantly less at their destinations than other tourists. In addition, the data indicate that cruise tourists overestimate their expenditure to a higher degree than other tourists. Some possible implications are indicated." Cruise passengers expenditures are lower than the expenditures of other tourists. Few high spenders and more low spenders among cruise tourists. Cruise tourists spend less on almost every category of consumption. Cruise tourists over estimate their expenditures more than other tourists. Midwood Report Bill Morris (2012) calculates spend at $75 per person. 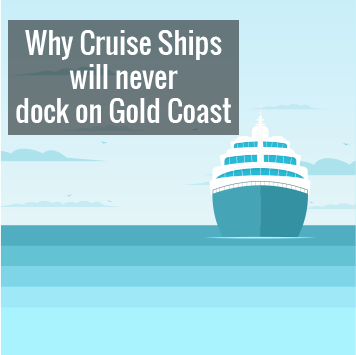 The AECgroup'Business Case' report (commissioend by GCCC 2012) estimated a Gold Coast cruise ship terminal will require totally uncompetitive port and passenger charges of '5-6 times more' than passenger charges in existing Australian ports to 'break even'; that is, $100-120 per passenger. No cruise comapny would consider visiting a port that required these levels of passenger port charges. Destruction of sea grass beds - marine life nurseries. Loss of migratory shore birds and habitat, protected under international treaties. Threatens endangered species such as turtles and dugong. Ships generate the equivalent air pollution of 12 - 14,000 cars per day while in port. Increased crowds, commercial traffic, pollution in already congested city areas. 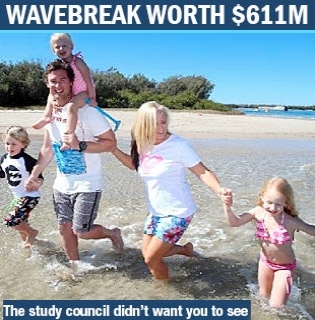 "The only locals profiting from the cruise ships are the port authorities, and also occasionally tourist guides and industries built specifically to cater for the cruise ship sector. Only limited resources reach public toilets, local shops, or tourist attractions, according to Larsen. He believes local authorities need to rethink their policies on tourism. – Maybe local authorities need to focus more on sustainable tourism, he suggests. – Young people and families spend a lot of money when on holiday. Cruise tourists, on the other hand, will rather visit a non-entrance fee museum rather than, say, the Bergen Aquarium, where you have to pay an entrance fee. - This is not sustainable tourism, Larsen believes. – There may be queues when the cruise tourists visit town, but they don’t leave much behind for the local economy."